This site is kept alive by the good people at Demir Leather. One of their family members participated in the EUC Volleyball Championships thus, it was decided that they keep the memories alive. 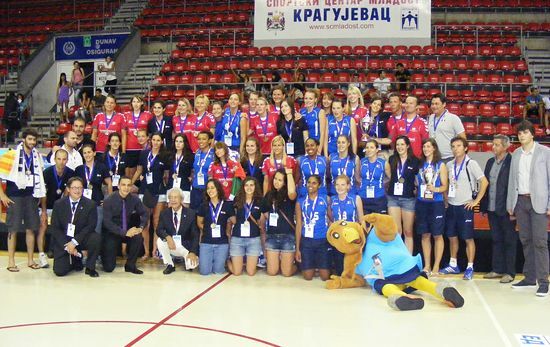 As a prelude to the Opening Ceremony of the 11th European Universities Volleyball Championship, the OC organized a march pass of the athletes through the main street of the city of Kragujevac where the championship is taking place between July 10 and 17, 2011. All of the participants – 9 women and 8 men’s team, together with the volunteers participated in this little introduction which lasted for about an hour. The Opening Ceremony was held in the courtyard of the University Rector Hall with important guests seated in the VIP lounge – for instance the Minister of Youth and Sports Mrs Snežana Samardži?-Markovi? and the Rector of the University of Kragujevac Mr Slobodan Arsenijevi?. Numerous members of the press were also present at the ceremony. After the announcement of the universities which are participating in this years’ volleyball championship the Rector spoke first and gave an inspiring speech about the sport spirit. Afterwards followed the speech of the member of EUSA Executive Committee Mr Dinos Pavlou who introduced the technical delegates Mr Jean Loup Miguet and Mr Joerg Foerster and other members of the SCAC. He expressed his delight with the whole organization of the Championship, reserving special praise for two members of the Organizing Committee – the president of the University Sports Association of Kragujevac Mr Nenad Tanasijevi? and the PR Manager of the Championship Mr Marko Petrovi?. Mr Pavlou then introduced the Minister of Youth and Sports who proclaimed the tournament officially open. The oaths of the athletes and referees came next and the intonation of the EUSA anthem performed by the University choir. As a part of the cultural program two distinguished musicians performed for about twenty minutes and after that the participants moved to the other part of the Courtyard where the party after the Opening Ceremony was arranged. 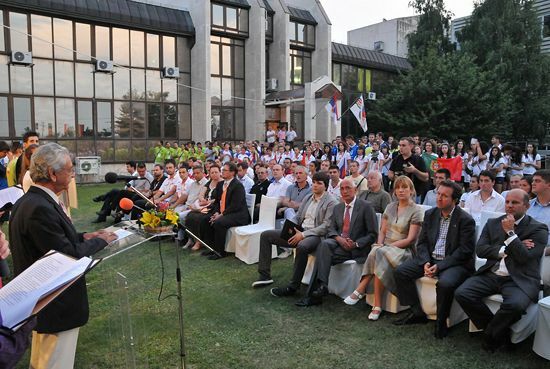 The championship concluded on July 17th with an exciting Closing Ceremony at the “Jezero” Hall in Kragujevac, Serbia. Over 200 participants from 15 Universities from 12 countries took part in this year’s edition of the event. 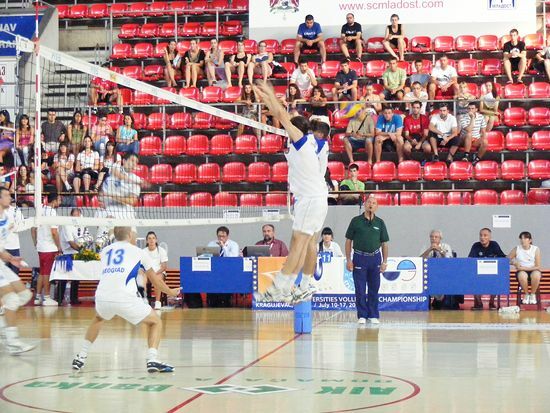 In men’s finals, the title of champion went to the home team of University of Kragujevac (SRB) who has won a thrilling final match against the University of Belgrade (SRB) in front of more than 1000 spectators in the “Jezero” Hall. In women finals, the title of champion went to the University of Chemnitz (GER) who has won an exciting final match against the University of Montpellier (FRA) after losing the first two sets. Medals and awards were presented by the member of the EUSA Executive Committee Mr. Dinos Pavlou, the Technical Delegate of the Championship Mr. Jörg Förster, the President of the University Sports Association of Kragujevac Mr. Nenad Tanasijevi?, the representative of NUSA and the PR Manager of the Championship Mr. Marko Petrovi?, the Assistant Mayor Mr. Jovan Pavlovi?-Bojadži?, and the Student Vice-Rector Mr. Stefan Aleksi?. THURSDAY – CETVRTAK, 14.07.2011 god.